These simple baked apples are a beautiful, and delicious, fall dessert! Peel and core apples and cut them into thin slices. Mix brown sugar, white sugar, cinnamon, and salt, together and pour it into a gallon freezer bag. Add apple slices and shake until they are thoroughly covered. Grease your baking dish (I used a 9" round dish but any baking dish will work). Layer apple slices in baking dish, one slightly on top of the other, until it is completely filled. Scatter the pats of butter across the top of the apples. 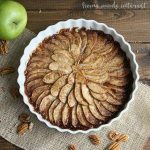 Bake for 25 - 30 minutes or until apples are tender.